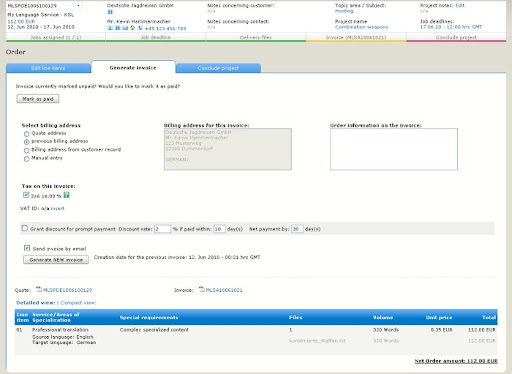 After delivering a project in OTM, it's simple to generate and send the invoice. 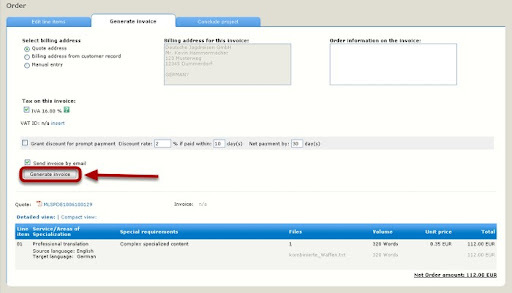 Click on "Invoice" in the progress bar under the project summary near the top of the display to get started. Note that there are various options available for the billing address. The terms can also be altered here. If there have been changes to the rates or line items, go first to the Edit line items tab and make the necessary modifications. 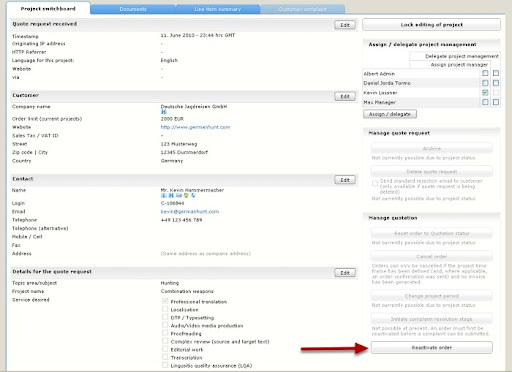 Otherwise, click the Generate Invoice button to create the invoice. The PDF invoice can be sent directly by marking the checkbox above the button to generate the invoice. If you intend to print and send a copy of the invoice using the postal service, it is not necessary to mark the checkbox. 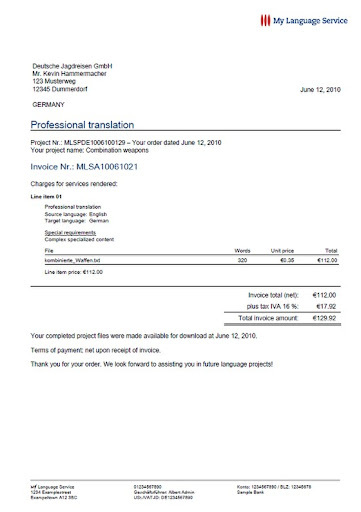 Here's a copy of the invoice that was created and sent to the customer. If you look at the Generate invoice tab again after the invoice has been created, you'll notice a new button to mark the invoice as paid. When the payment has been received, click the button. Clicking the Mark as Paid button will display a confirmation, then re-direct to the project switchboard. When you conclude a project you can also send a request to the customer for feedback. This is a good way to build your testimonials. After the project has been concluded, it will disappear from the order list. To view the project details once again (or to make changes, re-open the project, etc. 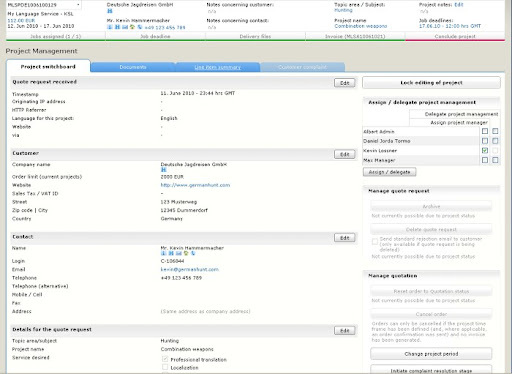 ), click the H icon under the company name or contact name in the project summary near the top of the screen. The project history for this customer is show above. Clicking the project number (blue text at the left) will open up the project switchboard view for the order. Notice that the entire progress bar is green, indicating that all steps have been completed successfully. If it is necessary to make changes, you can re-activate the order by clicking the corresponding button. Very impressive tutorials, Kevin. Thanks for going to all the trouble of putting them together. We will definitely have to look into this -- the interface looks quite user-friendly, clean, and frustration-free! These (slightly modified) and others are going online next week in the next OTM system upgrade. It's been quite interesting getting to know this system over the last 6 months, especially in the last 6 weeks since I've been working very intensively with it. Many of its quirks that irritate me reflect its origins as a working system for a large translation agency, but these have changed a lot since the initial pilot, and the result is a system in which I see a number of advantages for small shops and busy freelancers. I'll write a long post on this eventually (maybe), but one of the biggest benefits for me is the secure area for client deliveries. So often I have been messed up by unreliable Internet e-mail: I deliver a job early or on time, go off to do errands or enjoy a break without my computer, and 300 km down the road the client calls wondering when I'll send the file. Now they can check online themselves or I can tell them to do so, and no one is left hanging until I get my laptop set up again somewhere.